I’ve written about the superiority of visuals over verbals. And my daughter Laura Ries has written a book on the subject, Visual Hammer. When you read the words “step down,” the left “aural” side of your brain understands the words and the right “visual” side creates a mental picture of a person stepping down. Verbal words and visual words. The more abstract the idea, the more likely it is expressed with verbal words. The more specific the idea, the more likely it is expressed with visual words. Big, conceptual ideas like high-quality products, state-of-the-art technology, customer-oriented sales force, world-class service and many other concepts are almost useless in marketing. Yet companies tend to use such lofty ideas in their slogans. Confidence in motion is Subaru’s long-running marketing slogan, an allusion to the brand’s dominance in four-wheel-drive vehicles. But wouldn’t it have been better to use Leader in four-wheel drive as a slogan? Zappos could have used Confidence in ordering as its marketing slogan. Instead, the brand used Free shipping, both ways, an idea that could be instantly visualized. The ultimate driving machine is another example. BMW could have used a more-comprehensive slogan like The ultimate performance machine. But driving can be visualized and performance cannot. Pizza. Pizza. This famous Little Caesars slogan is another good example. “Two pizzas for the price of one” was a necessary ingredient in creating the idea. But once consumers associated the idea with Little Caesars, the chain could shorten it to a powerful “visual” idea expressed by the words Pizza. Pizza. The 10 largest advertisers in 2015. Here are their advertising slogans. (2) 15 minutes could save you 15% or more on car insurance. (8) Best value in wireless. One slogan most people would remember is the Geico slogan: 15 minutes could save you 15% or more on car insurance. It’s specific, not general. And it is long (11 words) as compared to the longest slogan of the other nine brands which is just four words. Furthermore, Geico uses a visual device (the Gecko) to help visualize the brand. The other slogan most people would remember is the McDonald’s slogan: I’m loving it. One reason is that McDonald’s has been using the same slogan for more than a decade. Most consumers probably don’t remember the other eight slogans (which received $6.4 billion in advertising in 2015.) None of them use visual imagery. That’s not exactly true. Find new roads, the Chevrolet slogan, does use visual imagery. But in a negative way. Taken visually, it means getting off existing highways and finding new roads. That’s not what Chevrolet had in mind, however. Listen to the way consumers talk. It’s only politicians and marketing people who speak in verbal words. Consumers much prefer visual words. Why do consumers call a table that holds everything, including beverages, a coffee table? Wouldn’t it be more logical to call it a beverage table? It would, but beverage is a verbal word and coffee is a visual word. Why do consumers call a case designed to hold clothing, shoes, toiletries and other personal items a suitcase? Wouldn’t it be more logical to call it a clothing case? It would, but clothing is a verbal word and suit is a visual word. Why do consumers call a store that sells toiletries, cosmetics, school supplies, greeting cards, beverages, snacks and drugs a drugstore? Would it be more logical to call it a personal-items store? Or at least a pharmacy, a name displayed prominently on every drug store? It would, but pharmacy is a verbal word and drug is a visual word. A gas station often includes a car wash, a convenience store and auto-repair facilities. Yet consumers still call it a gas station. Gas is a visual word. Marketing people obviously know this because most advertising campaigns make extensive use of visuals. You seldom see an advertisement without a visual. But I wonder how many marketing people realize the power of using visual words instead of verbal ones. Go back in history and look at the power of conceptual ideas expressed with visual words. In the early 1970s, American political leaders justified their increasing military involvement in Vietnam by asserting that if the country fell, the entire Southeast Asian region would also fall to communism. They used visual words to justify the war. The domino theory. Currently, Congress is postponing debt reduction until sometime in the future. Congress is kicking the can down the road says the same thing with visual words instead of verbal ones. Some of the most memorable poetry makes extensive use of visual words. Joyce Kilmer, 1913: I think that I shall never see . . a poem lovely as a tree. Thomas Gray, 1751: Full many a flower is born to blush unseen . . and waste its sweetness on the desert air. Poems are not trees. And people are not flowers. No matter. 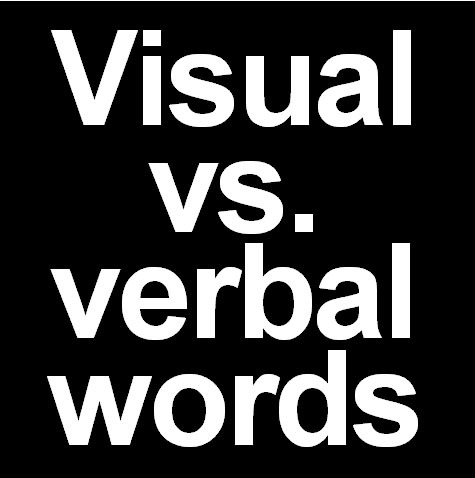 When you can use visual words instead of verbal ones, your words can become emotionally much more powerful. If you want to influence consumers, listen to the way they talk. I bought a Subaru last month and I didn’t hear one prospect ask for Confidence in motion. They did, however, talk a lot about four-wheel drive.